This last year for Bandit Runners has been a hard one. We had the great joy of having our beloved Burt join us in Jupiter for the Run, only to have great sadness when we lost him in September. So, for this year’s route, we’re going back to our roots. We’ll be traveling through the heart of the US through small towns with beautiful scenery, at a slower pace and doing what Burt did best- have fun and show off. Our journey will take us from Fort Worth, Texas up to Kansas City, Missouri. Although the complete route has not been finalized, we will cruise through Oklahoma, Arkansas, and Missouri. We will be staying in Fort Worth, TX; Fort Smith, AR; Eureka Springs, AR; Branson, MO; and lastly, we will roll into Snowman’s hometown for a Rally in the Valley in Kansas City, Missouri. Mark these dates on your calendar – Saturday, June 22nd – Saturday, June 29th. 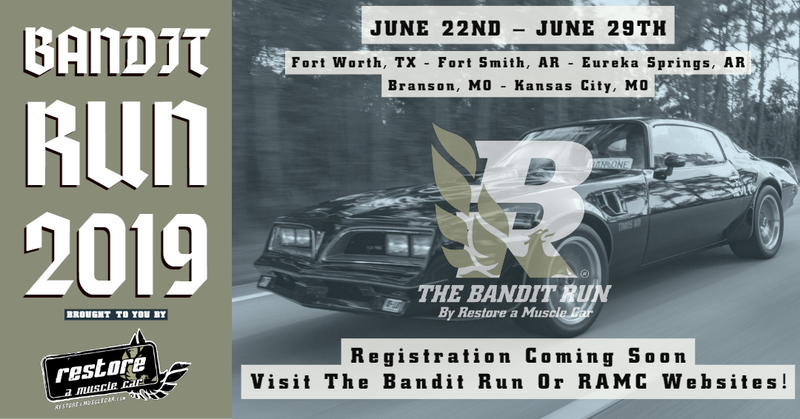 Registration and hotel information will be coming soon on the Bandit Run and RAMC websites. In addition, we will have a condolence book we will be putting together to honor Burt. You will have the chance to write down and share your favorite memory of the movie, the car, or of Burt. You may even add a photo of you and your car or you and Burt if you have one. At the end of the Run, the book will be sent to his family. The Bandit Run is brought to you by RESTORE a MUSCLE CAR in Lincoln, Nebraska. Follow the website and their page here on Facebook for more updates. https://www.facebook.com/groups/811216475623797/, or www.thebanditrun.com . 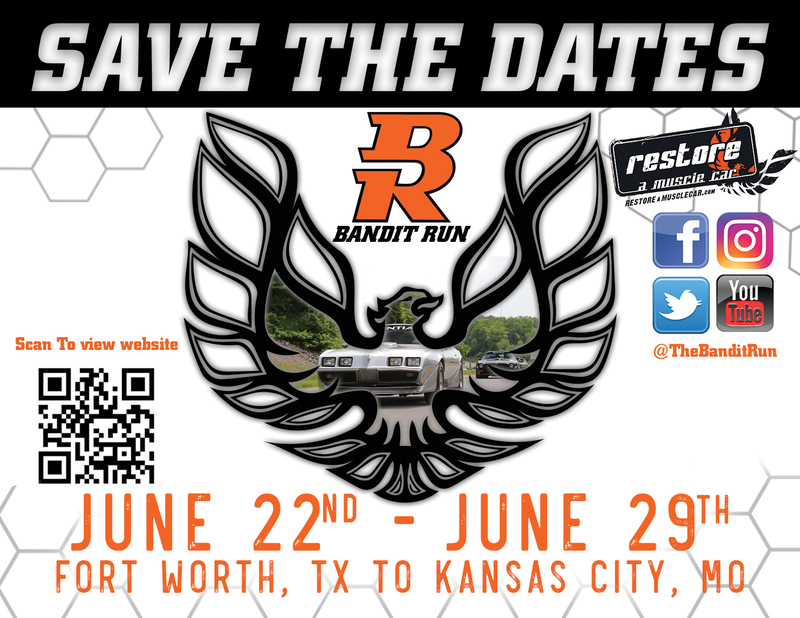 Make plans now to join your Bandit Run Family as we hit those back roads Bandit-style to do what we do best.